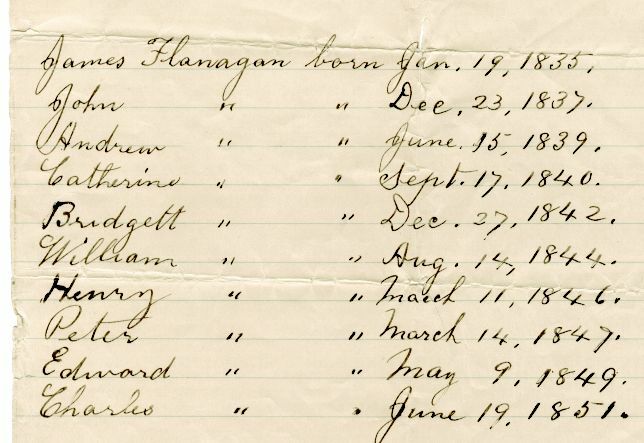 List of the children of Andrew and Sarah (Matthews) Flanagan born in the U.S. 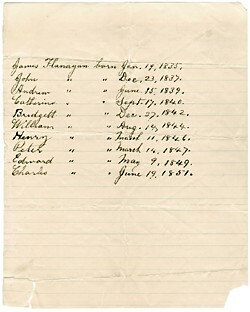 Page is 8" x 10" and in the care of the Fagan family (descendants of Charles, born 1851). James was born in Brooklyn. All others were born in Astoria, Queens Co., New York. Missing is Ann Nora Flanagan, born Apr 11, 1833 in West Bromwich, Stafford, England, and probably deceased in England as an infant.